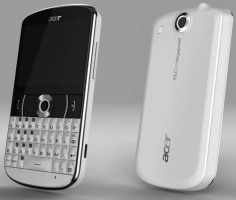 Acer presented two new Android-based smartphones today - the candybar beTouch E120 and the QWERTY-bar beTouch E130. Both devices run on Android v1.6 Donut, have 3.2 megapixel snappers, ST Ericsson 416MHz processors, 256MB RAM, 512MB ROM, and full connectivity package - Wi-Fi, 3G, GPS, Bluetooth, FM radio and 3.5mm audio jack. The common specs sheets end with an accelerometer for auto-rotate and a microSD card slot. Acer beTouch E120 sports 2.8-inch QVGA touchscreen, while beTouch E130 uses 2.6-inch landscape QVGA touchscreen and full-QWERTY keyboard below it. The QWERTY bar form factor is definitely a novelty in the Android world. We are already familiar with E130, since it was recently showcased at Computex 2010. Both beTouch devices run on Android OS v1.6 Donut and will feature additional software such as Acer Spinlets (for accessing or sharing media content) and UrFooz (for social networking). Both phones will be released in Q3 this year in black and white versions. Acer beTouch E120 will hit the shelves in mid-July, while its QWERTY sibling E130 is expected in August. There is no word on pricing yet. Android OS is funny. New phones come with old android os. It's like buying a new stylish, powerful laptop/pc with windows98 os.